Due to the ever-increasing adoption of Internet and mobile technologies, digitalization in the Arab world has been registering soaring growth rates. Following the turn of the millennium, different nations in the region made significant strides in the installation of mobile communication networks, where network operators and Internet providers enhanced their transmission capacities to 3G and beyond. Progressing at different paces, Internet penetration reached a peak of over 90% in GCC countries and 80% in Lebanon, in comparison to 50% in Morocco and 30% in Tunisia. Furthermore, the Arab world is steadily developing into a potential production site in the IT-sector owing to a myriad of favourable circumstances, such as its geographical proximity to Europe, minor time differences, and the abundance of talent and labour. Against the backdrop of current developments, the digital business start-up scene has been flourishing across the region, from Tunisia and Egypt, to Jordan, Lebanon and the Gulf states, spanning a multitude of sectors, including education, healthcare, finance, transport and logistics. In other words, it is nothing short of a booming, versatile and diverse scene. The 1st German-Arab Digital Forum, hosted by the Euro-Mediterranean-Arab Association (EMA e.V. ), together with the CeBIT and German Federal Ministry for Economic Cooperation and Development (BMZ), will focus on the digital transformation of the Arab World. The spectrum of debates will include the alterations in frame conditions and infrastructure, as well as the up-and-coming regional hubs that are becoming centerpieces of digital economy in the MENA region. * Christian Wulff Former President of the Federal Republic of Germany, President of the Euro-Mediterranean-Arab Association. * H.E. Mouhamed Anouar Maarouf Minister of Communication Technology and Digital Economy, Tunisia. * Günter Nooke BMZ’s Commissioner for Africa, Federal Ministry for Economic Cooperation and Development (BMZ). Participation is free of charge. 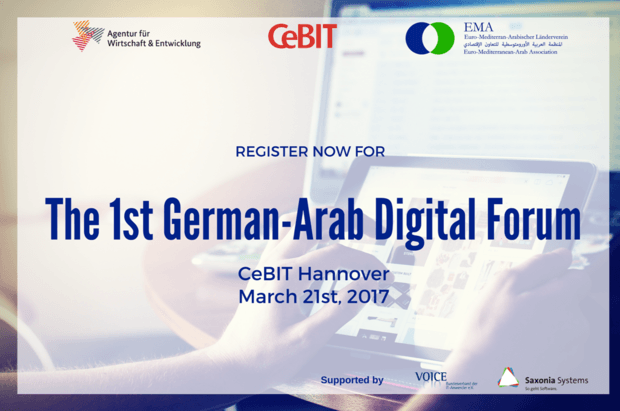 Every participant of the German-Arab Digital Forums receives a day ticket for entry to the CeBIT for March 21st, 2017. Participation requires a prior confirmation of registration. Conference languages: Arabic/German with simultaneous interpretation.